ASUS Republic of Gamers (ROG) today announced that its latest gaming systems, including the new ROG Zephyrus M GM501 gaming laptop and the new ROG Huracan G21 gaming desktop, are now powered by the latest six-core 8th Gen Intel Core processors. 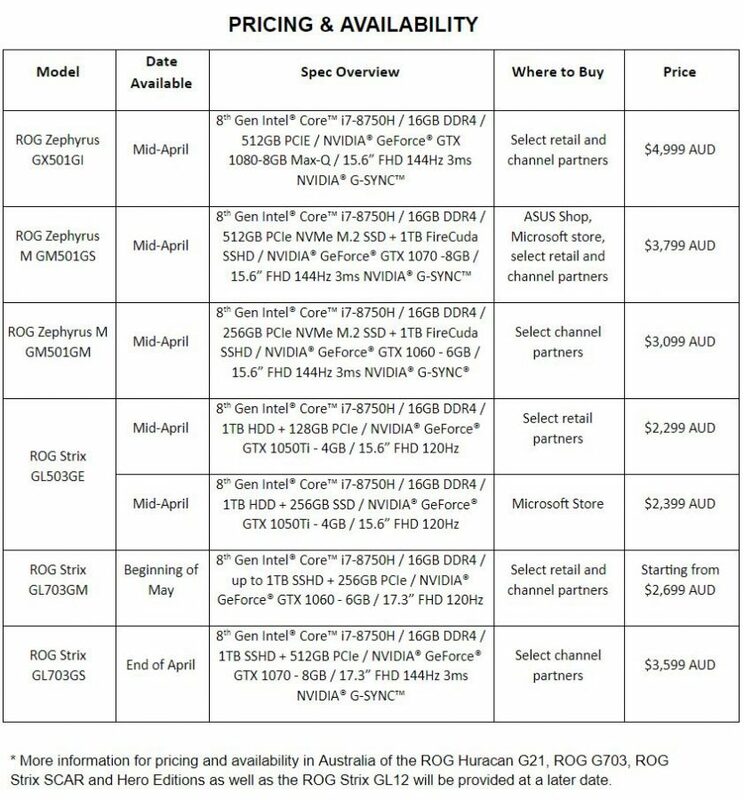 Other products powered by the new processors include the ROG Zephyrus GX501GI, ROG G703, ROG Strix SCAR Edition, ROG Strix Hero Edition, and ROG Strix GL503/703 gaming laptops, as well as the ROG Strix GL12 gaming desktop. All products powered by the latest six-core 8th Gen Intel Core processors feature ASUS Aura Sync technology allowing gamers to customise the lighting to suit their own style and preference. The ROG Zephyrus M GM501 provides users with gaming-desktop levels of performance in a slim and compact package. At just 17.5mm at its thinnest point, the ROG Zephyrus M is the world’s slimmest gaming laptop powered by a six-core 8th Gen Intel Core i7-8750H processor and NVIDIA GeForce GTX 1070 graphics. It is also the first such laptop to feature an IPS-level AHVA display with a superfast 144Hz refresh rate and ultra-responsive 3ms gray-to-gray (GTG) response time. The ROG Zephyrus M GM501 features our patented Active Aerodynamic System (AAS) which first appeared in the original ROG Zephyrus GX501. This trend-leading airflow gap at the bottom of the laptop helps improve airflow and cooling in such a slim device by allowing the bottom panel to be raised when the display is propped open. There are also new, more powerful, 12V fans with new anti-dust chambers ensuring a cooler and cleaner airflow throughout the entire laptop. A new and exclusive feature, distinguishing the ROG Zephyrus M further, is the ability to allow users to switch GPU modes according to the task at hand. The NVIDIA GeForce GTX 1070 discrete graphic card offers powerful gaming performance when needed, however using NVIDIA Optimus technology, the discrete graphics card can be switched off, allowing for drastically improved battery life when powerful gaming performance is not needed. The ROG Zephyrus M is able to do this and also offer NVDIA G-SYNC technology when the discrete graphics card is active. Users can take advantage of this feature from the included ROG Gaming Centre which also features a dedicated button above the keyboard. The ROG Huracan G21 is powered by a six-core 8th Gen Intel Core i7 processor and NVIDIA GeForce GTX 1080 graphics for extreme gaming performance. It features a patented magnetically-secured side cover that can be opened to increase airflow for better cooling, as well as an option to enable a CPU and GPU performance boost and special ASUS Aura RGB lighting effects. The ROG Huracan G21 has a 2.5-inch hot-swap bay for an SSD, and a slide-open chassis design that makes it easy to maintain and upgrade components. An ESS Sabre DAC and amplifier on the front audio jack provide high-fidelity sound. In addition, gamers can use ASUS Aura Sync to synchronise light effects with other Aura Sync-compatible products. The ROG Zephyrus GX501GI is the world’s slimmest gaming laptop that’s powered by the latest six-core 8th Gen Intel Core i7 processor and NVIDIA GeForce GTX 1080 graphics with Max-Q design. The 15.6-inch ROG Zephyrus features an ultraslim profile and incorporates the ROG-exclusive Active Aerodynamic System (AAS) — a specially designed cooling system that also includes our new anti-dust cooling chambers and Fan Overboost technology. It has an IPS-level AHVA panel with a fast 144Hz refresh rate, 3ms response time and 100% sRGB colour gamut and NVIDIA G-SYNC technology for flawless gaming visuals. The ROG G703 is powered by a factory-overclocked 8th Gen Intel Core i9 processor and NVIDIA GeForce GTX 1080 graphics for unrivaled gaming performance in a laptop. It has a 17.3-inch FHD IPS-level AHVA display with a 144Hz refresh rate, 3ms GTG response time, NVIDIA G-SYNC technology, and a matte anti-glare coating. The HyperDrive Extreme storage found in the ROG G703 uses exclusive technology to provide gamers with RAID 0 SSD performance of up to 8700MB/s — the fastest ever found in a laptop. The ROG Strix SCAR Edition is designed to give gamers a competitive edge in FPS esports titles like Counter-Strike, Overwatch, and Team Fortress 2. This gaming laptop is powered by up to the latest six-core 8th Gen Intel Core i7 processor and NVIDIA GeForce 10-Series graphics, and features an IPS-level AHVA display with a 144Hz refresh rate, 3ms response time, and NVIDIA G-SYNC technology for super smooth visuals. The ROG Strix SCAR Edition also has a desktop-style keyboard with ASUS Aura Sync, N-key rollover, and fast-actuating keys. The ROG Strix Hero Edition is designed to give gamers a competitive edge in Multiplayer Online Battle Arena (MOBA) games such as League of Legends and Dota 2, as well as RTS and RPG titles. This gaming laptop is powered by up to the latest six-core 8th Gen Intel Core i7 processor and NVIDIA GeForce 10-Series graphics. It features a 120Hz display with wide-view angle technology and a 130% sRGB colour gamut. The ROG Strix Hero Edition also has a desktop-style keyboard with ASUS Aura Sync, N-key rollover, and a 20-million-key-press lifespan. The ROG Strix GL503/703 is designed for esports gaming and is powered by the latest six-core 8th Gen Intel Core i7 processor and NVIDIA GeForce GTX 10-Series graphics. It features the patented Anti-Dust Cooling (ADC) system that expels harmful dust particles and dirt from the system to improve stability and durability. It includes ASUS Aura Sync technology so gamers can customise and sync light effects with compatible gaming mice, headsets, and other peripherals. The ROG Strix GL12 is powered by up to a six-core 8th Gen Intel Core i7 processor and NVIDIA GeForce GTX 1070 graphics. This gaming desktop has a striking, unconventional design and features an esports-ready hot-swap bay for a 2.5-inch SSD that allows gamers to remove and replace the drive in seconds, all without having to shut down the system.